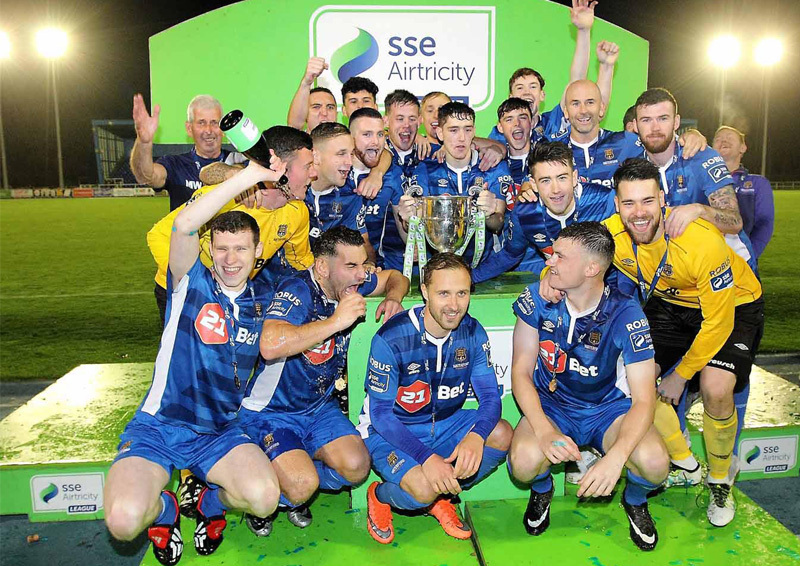 David McDaid struck the only goal of the game as the Blues ran out 1-0 winners over Longford Town on Friday night before being presented with the SSE Airtricity League First Division trophy. Mark O’Sullivan could have capitalised on a defensive error on two minutes when the striker nipped the ball off the hesitant Longford keeper Jack Brady but his attempted lob of the netminder was brilliantly caught by the recovering keeper. Karl Chambers had a half chance for the visitors on eight minutes when he fired in a shot from distance but keeper Ian McLoughlin made a fine save at the second attempt, before Mark O’Sullivan was unlucky not to find the run of Sander Puri with a through ball shortly afterwards. 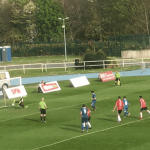 Paul Keegan went close to putting the Blues in front on 36 minutes when he fired in a shot from the edge of the penalty area that was deflected just wide, before Sean Heaney headed the resulting corner wide. The Blues had a great chance to take the lead on 47 minutes when Paul Keegan sent in a cross from the right that was met by the head of Mark O’Sullivan but his close-range header was straight at the visiting keeper Brady. Longford had a good opportunity of their own on the hour mark when Sam Verdon cut in from the left before forcing Ian McLoughlin into a smart diving save, before Garry Comerford had a chance at the other end on 68 minutes but his effort from close range was saved. 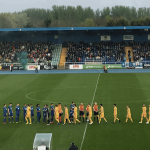 David O’Sullivan was denied the lead goal for the visitors when his strike was deflected narrowly wide of the right-hand post by Paddy Barrett before the RSC erupted on 81 minutes when the Blues struck the front. A brilliant through ball from Aaron Drinan sent David McDaid into the clear and he showed his class to lob the ball over the head of the advancing keeper Brady from from just inside the penalty to give the send a packed RSC into celebrations and seal a 1-0 win before the trophy was presented.